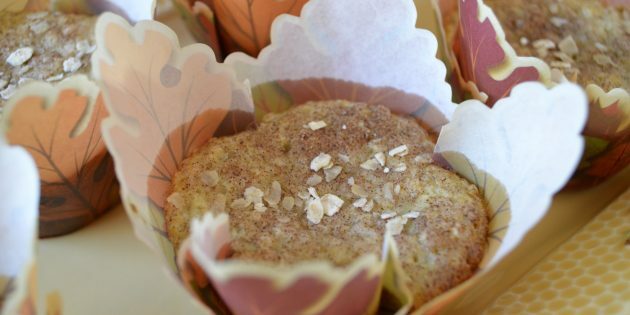 I love the slight chew you get with this muffin from the gluten free oats. It imparts an earthy flavor and texture that is full on comfort food. Since it’s possible to buy certified gluten free oats at just about any store now ( hooray! ), you can have fresh hot oat muffins any time you want. As with all things gluten free, be sure to check with your physician about introducing certified gf oats into your diet. 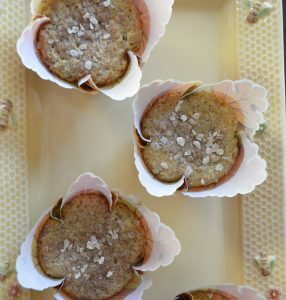 Place muffin papers in a 6-cup muffin pan and set aside. In a medium bowl, whisk together all the dry ingredients up to the salt. Don’t whisk in the sugar. You need to add that to the wet ingredients. In a large bowl, place the 3 tbsp. sugar, egg, bananas, oil and the vinegar. Beat with a hand held electric mixer until completely mixed together. Slowly beat in the flour mixture so you can avoid the presence of “flour clouds” in your kitchen. Use a cookie scoop and evenly divide up the batter into the 6 paper muffin cups. Sprinkle the tops with a few rolled oats, if desired. Set the muffins aside on the counter to rest for 30 minutes. Go ahead and preheat the oven to 350 degrees. When the 30 minutes is up, pop the muffins in the oven and bake for 22 to 25 minutes until a toothpick inserted near the center comes out clean. If they start to brown too much, place a piece of aluminum foil over the top of muffins to protect them. Remove from the oven and place on a rack to cool for 5 minutes. Then take the muffins out of the pan and place them on a wire rack to cool completely. These are great just on their owns. You can add a little butter if you want. Enjoy and bake something awesome today!